Dogs have been known to play some very important roles in the past, however this latest story has seen one dog in particular step up to a job that has saved the life of two rare liger cubs. 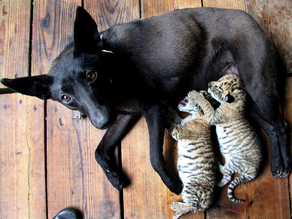 This special dog has unbelievably become a substitute mother for the newborn cubs after they were abandoned by their own mother for unknown reasons. The cubs are part of a rare mixed breed that were born earlier in the month at Xixiakou Wildlife Zoo in Eastern China. Liger clubs are a combination of both male lion and female tiger and have been known to sometimes be bred in zoos by mistake. In this case the two cubs are very fortunate that a loving dog who had just given birth herself was prepared to carry her motherly instinct over to the pair, not only nursing them but providing them with milk to drink so they can grow into strong healthy ligers!